It’s cold, scary cold, the thermometer on the porch reads -15 F and a light wind blows from the northwest adding additional discomfort to the already frigid temps. The moonless night completely obliterates any and all light, making navigation into the woods impossible were it not for the illumination of my headlamp. My first tentative steps off the porch compress a snow the consistency of Styrofoam and the squeaking noise sends shivers down my spine. My planned 5-hour sit promises to be long and uncomfortable, despite my best preparations. I begin walking through the frigid night and 10 minutes later arrive at the bait site. The ground is littered with coyote tracks and the road killed deer carcass has been completely dug out of the snow and ice. I quickly and quietly open to the door to the hunting shack and slip inside. The shack is very basic and contains little insulation beyond its quarter inch thick plywood walls and ceiling. The shack’s one small luxury, a well-padded lounge chair, designed to offer ones posterior comfort through the long, cold dark night. While the shack contains a small propane heater, I dare not start up its welcoming heat lest the smell of propane frighten away my targeted prey. I check my wristwatch and it reads 1:00 AM. I place my R15 into the gun rest and slowly slide the barrel out the window. A parachord loop hangs from the ceiling, suspending the gun in midair and allowing for hands free operation. Such a set-up is necessary when a long sit is expected and your intended query could only potentially present a shot opportunity measured in seconds. I turn on the W1000 thermal weapon sight and peer into the cool green glow of its eyepiece. Using infrared technology, the W1000 senses differences in heat emitted by objects within it’s field of view, making where there was once only darkness, alive with depth and color. Trees, rocks and the ground appear painted in various shades of green and the 100 yards of darkness to the bait site is as “tactically” visible as if under the midday sun. Unlike night vision technology, the W1000 continues to function after sunrise, operating as effectively during daylight as nighttime. Using IR technology, the W1000 senses heat and not light and therefore will not “bloom” or fail to function when hit by direct sunlight. 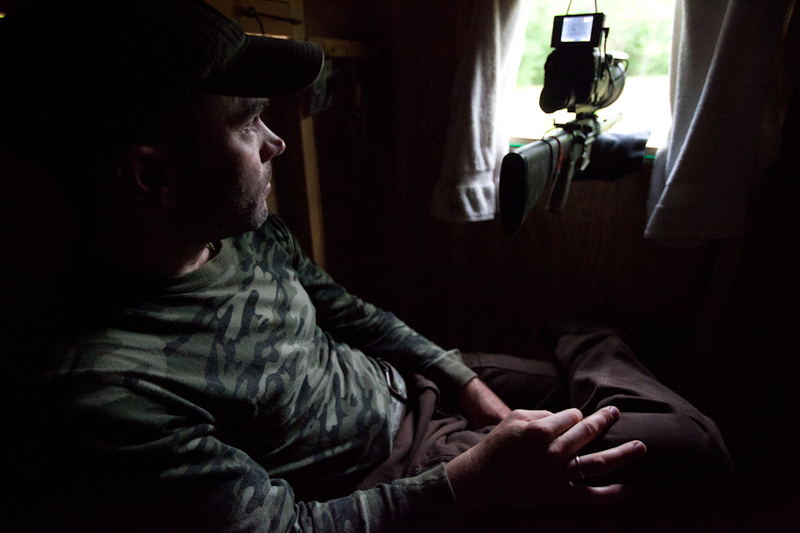 The unit’s standardized NTSC video output allows the device to easily connect to a digital recording unit, making it extremely simple to record your hunts. The small view screen on the video unit (sold separately) also makes it extremely easy to sit back and watch the monitor rather than continually sit forward to stare into the eyepiece, a great benefit on a long, cold sit. Settling in to my chair, I set the W1000 crosshairs on the bait site and quietly close the blinds heavy curtains in a desperate attempt to seal out the bone chilling cold. With the gun in position, a simple movement of my finger is all that is required to gently move the firearm and W1000 back and forth to effectively scan the bait site and immediate surroundings. Despite the hostile weather conditions, after 6-8 hours on a sit the battery on the W1000 still reads over 50 percent charge. In other words, I am always ready to call it quits way before the W1000. Of course as amazing it is to see in complete darkness, the real excitement occurs when a predator walks into the video frame. The W1000 separates “living” animals from the green hues of the background imagery by “coloring” them white or black. This is an obvious and very distinctive contrast from the green rocks, ground and trees. This creates a lot of WOW factor when after hours of hunting that first predator stumbles into the bait site. I was blown away just being able to watch small rodents and roosting birds at over 80 yards down range! The W1000 allow you to select from multiple targeting sights and choose white or black as the active coloring of any heat emitting predator unfortunate enough to stumble into your effective range. For hunters, the obvious choice was the standard “+” sight, matched to the “black” color scheme. This allows a high contract between the white colored “+” cross hairs and the black animal, making it easy to ensure proper bullet placement. The W1000 connects quickly and easily to the picante rail of any AR15 style rifle. A simple lever system attaches to the W1000 to the rail with a vice like grip. Targeting the rifle only requires you to use a hand heater pack taped to a bull’s eye. This small heat source creates a perfect sized shot signature and is all that is needed to create the temperature difference the W1000 needs pick it up on the viewfinder with ease. A few shots and follow-up turns on the W1000’s adjustment nobs and that is all that is required to get into the darkness chasing predators. Hunting with the W1000 is certainly a thrilling experience and I want to extend a special thanks to the fine folks at ModArmory for providing me with the opportunity to test their equipment through Maine’s rigorous winter coyote night hunting season. For the ultimate in high end predator hunting make sure to check out the impressive range of IR and night vision options offered by ModArmory.